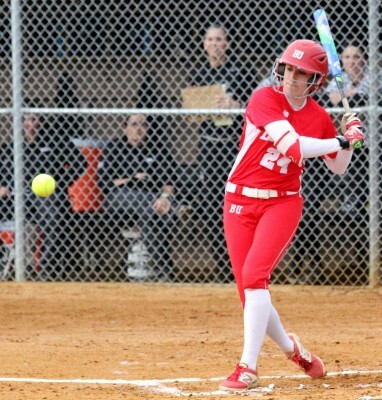 Despite falling in the second game of a doubleheader Wednesday, the Boston University softball team is fresh off its most successful week of the 2016 campaign. After struggling out of the gate, BU (20-21, 6-5 Patriot League) recently put together a seven-game winning streak — its longest of the season. According to BU head coach Ashley Waters, the streak should instill some confidence with the season’s home stretch nearing. The streak began April 17 in a 2-1 grind-it-out game against Bucknell University, but the majority of the subsequent wins were blowouts. Convincing victories over Bryant University, University of Massachusetts Lowell, conference foe Lafayette College and Patriot League-leading Lehigh University arose, showing BU’s potential. During those seven games, the Terriers owned a striking 33-4 run differential against their opponents and averaged about 4.7 runs per contest, just above their season average. One of the bright spots on the Terriers’ pitching staff this season has been the play of senior Melanie Russell. A native of San Diego, Russell has led by example and has now trimmed her ERA down to an impressive 2.83, good for seventh-best in the league. Russell was recently named the Louisville Slugger/NFCA Division I Co-National Pitcher of the Week and the College Sports Madness National Pitcher of the Week. She also became the first Terrier to be recognized by the NFCA since 2010. Although performances from Russell and senior pitcher Lauren Hynes have carried the team, BU’s offense has also been proficient as of late. Terrier bats have capitulated their way to the conference’s third-best batting average, and are now batting a collective .295. Led by the offensive spark that junior shortstop Brittany Younan provides (team-leading .366 average), the Terriers have six players batting above .290 on the season. Junior left fielder Moriah Connolly (.333), sophomore right fielder Emma Wong (.320), freshman second baseman Emily Morrow (.296), freshman catcher Alex Heinen (.293) and sophomore center fielder Jilee Schanda (.292) have all eclipsed that mark.